Amaranth is a good staple crop to start with, as it needs no dehulling. It can be very high yielding under the right conditions, and is easy to grow. Amaranth is gluten free, very nutritious and high in protein. I chose to start with Fercita, as it is a shorter variety than most, which makes it somewhat easier to work with, especially in gardens where space is limited. It also matures faster than most other types, making it more suitable for growing in the North. It is a great example of modern breeding and selection. Fercita was developed by Ecology Action in Willits, California. Fercita performed well even during the cool and unusually wet summer of 2014. I started my seed indoors around the beginning of May and transplanted into the garden on the 30th of May. I harvested the main seed heads on August 6th. The seed heads were harvested, once I could shake grain free from the plant. Given all the rainfall, I decided to cut a little early and hang the amaranth in my drying shed for a couple of weeks before threshing. 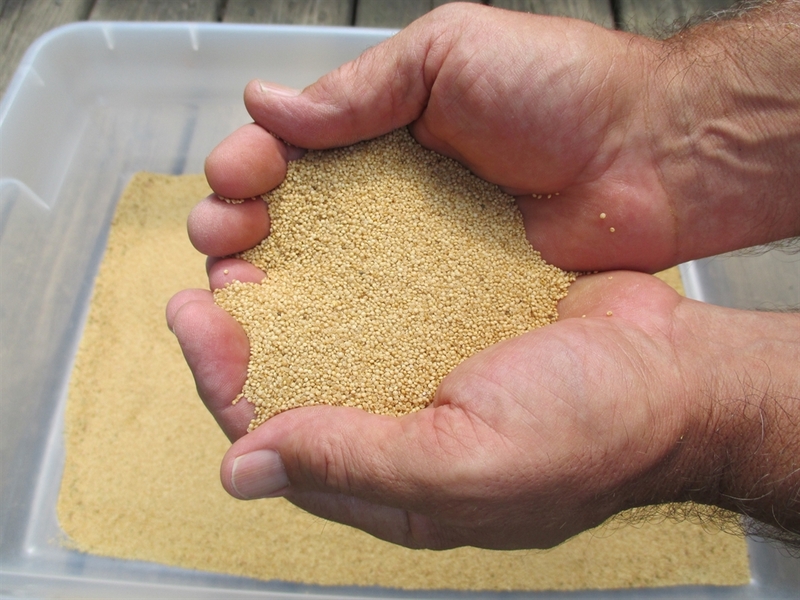 The grain can be easily removed by rubbing the dry seed heads between your hands. 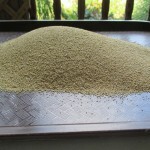 Winnowing is a little tricky as the grain is so small. 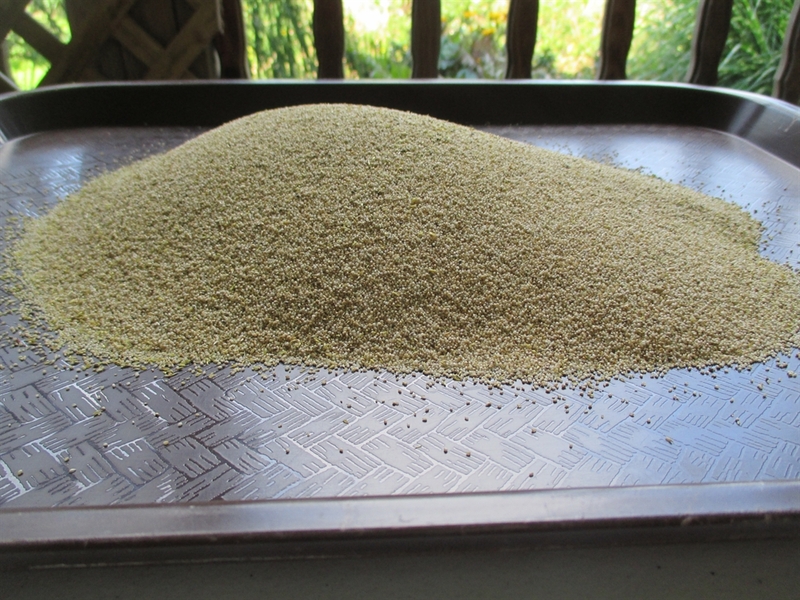 You will inevitably have some dry plant matter in with the seed but this is no problem, as amaranth leaves are edible and very nutritious (high in calcium). Any unwanted chaff can be easily floated off before cooking. Amaranth can be direct seeded but I recommend starting as plants indoors since the seed are so tiny and are planted very shallow (maximum of ¼ inch). They should be spaced at least a foot apart. 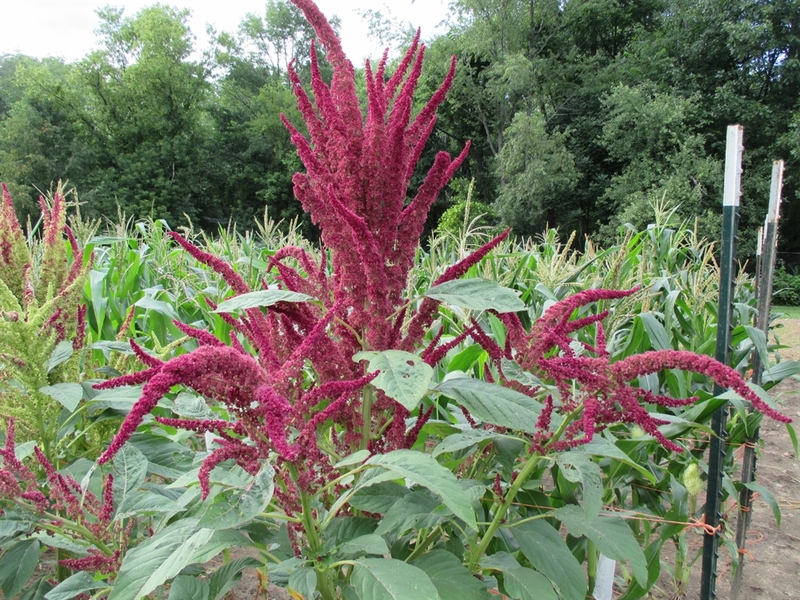 Amaranth will grow on marginal soils as long as it is not waterlogged. It is tolerant of drought and grows well in hot conditions.